Literature is one subject which is quite interesting to teach. When teaching this subject, the teacher mainly deals with stories, novels, and such. The students would learn all these throughout the course of the subject. 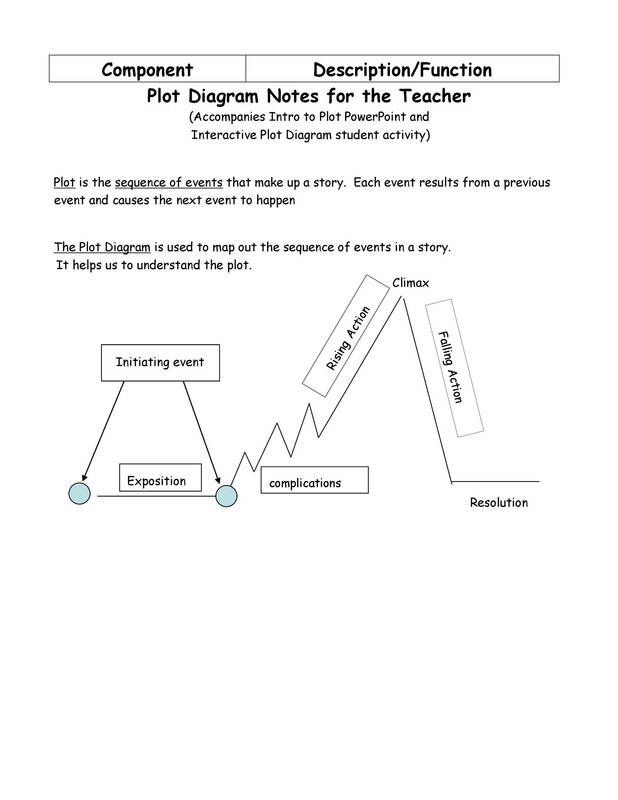 You may be a teacher and you want to explain the plot of a story to students. 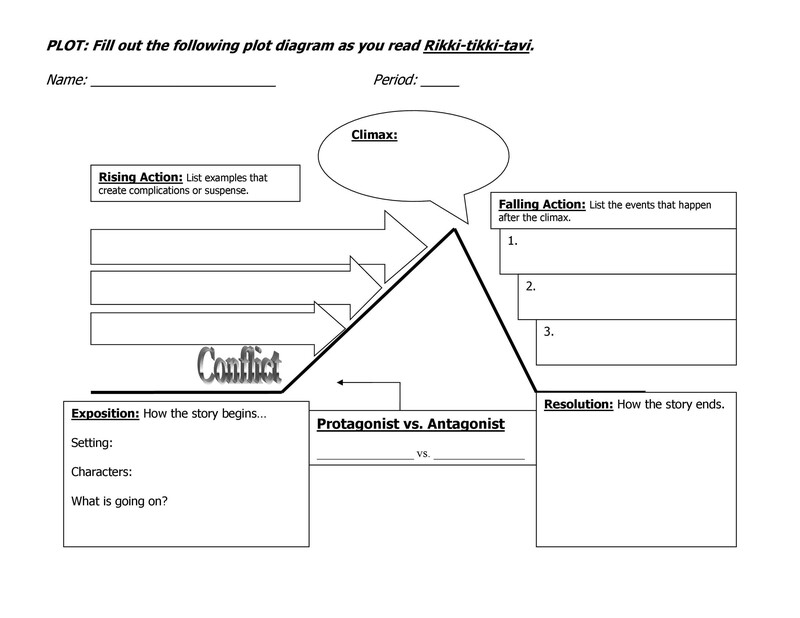 If so, it’s helpful to use a plot map or a plot structure diagram. 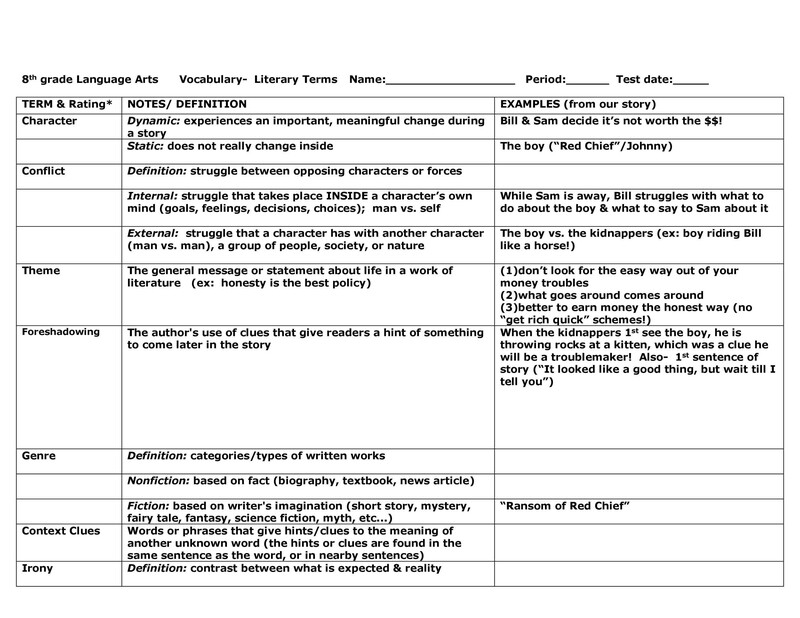 You can make a template to use each time you have a story to discuss. 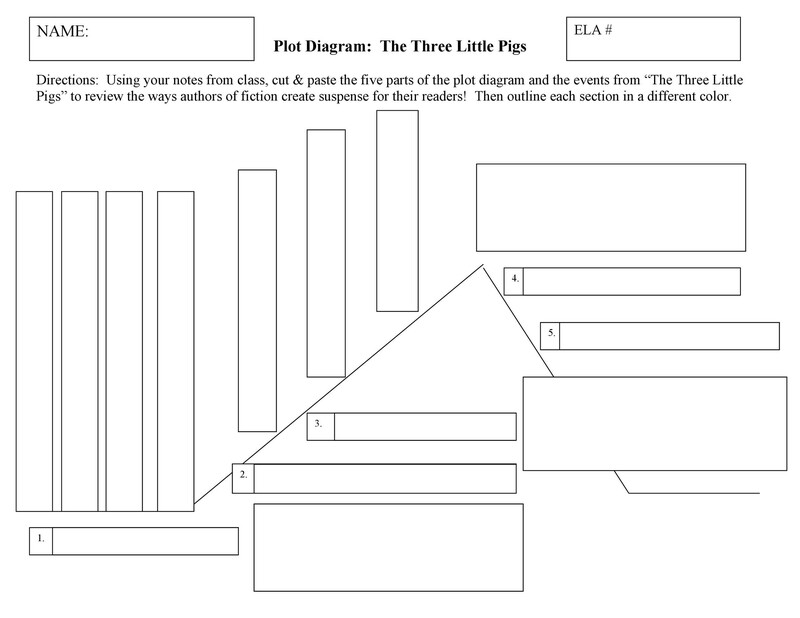 If you don’t want to make one, you may also download a blank plot diagram from here. The template would contain the most important parts of the story. This makes it easier for you to teach your children more effectively. 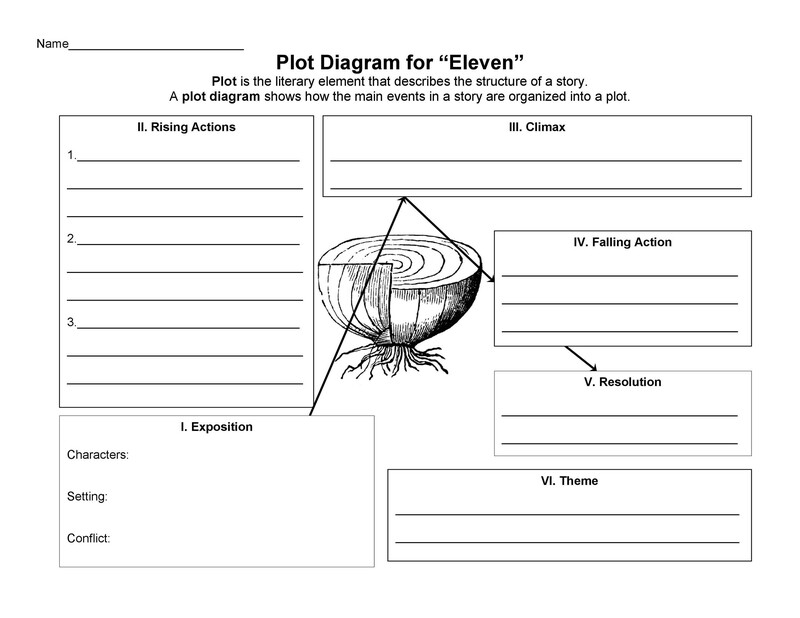 When teaching story plots to students, there’s a lot to think about. 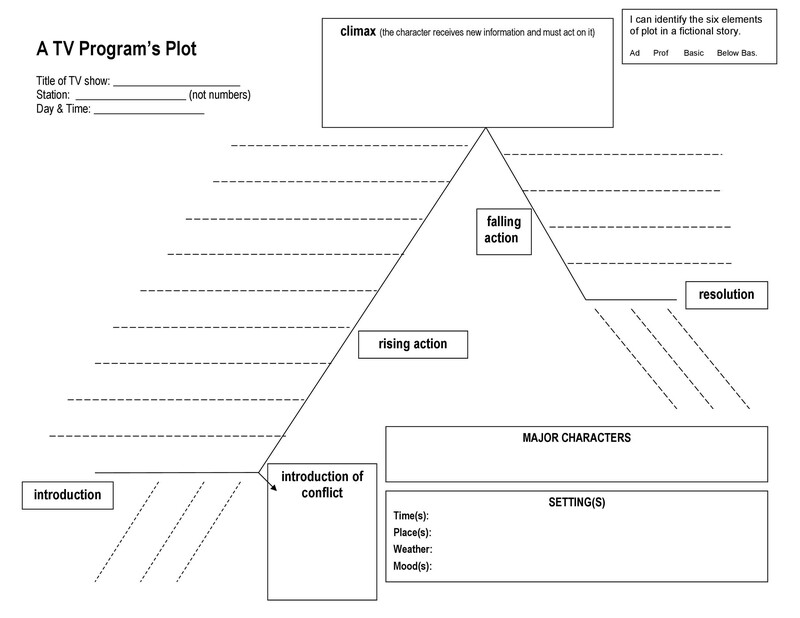 This is why a plot pyramid or diagram is very useful. 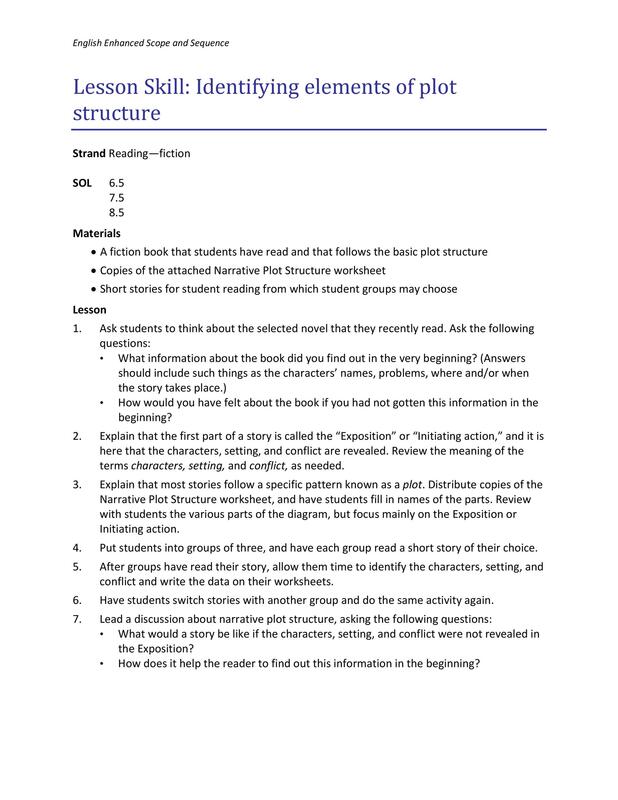 It will help your students better understand the story. 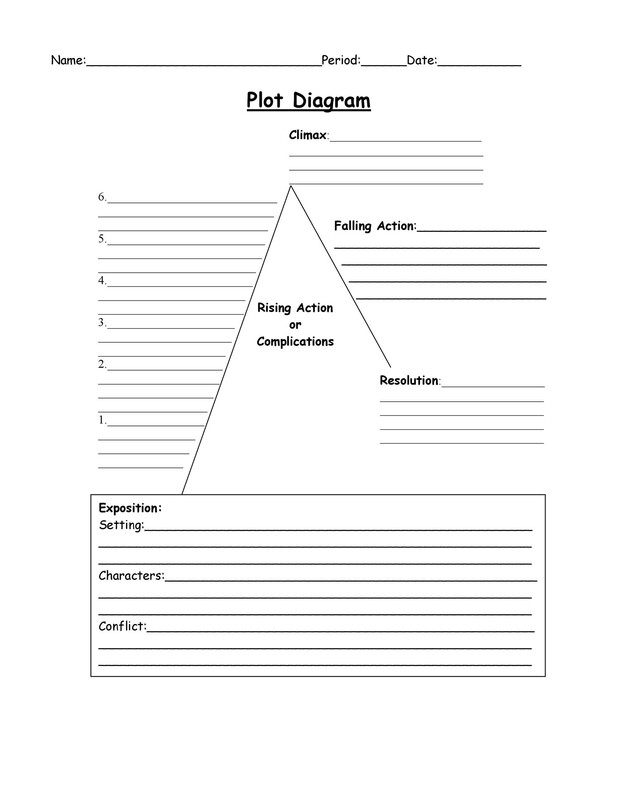 If you have no idea how to make such a template, download our plot diagram PDF and go through it. 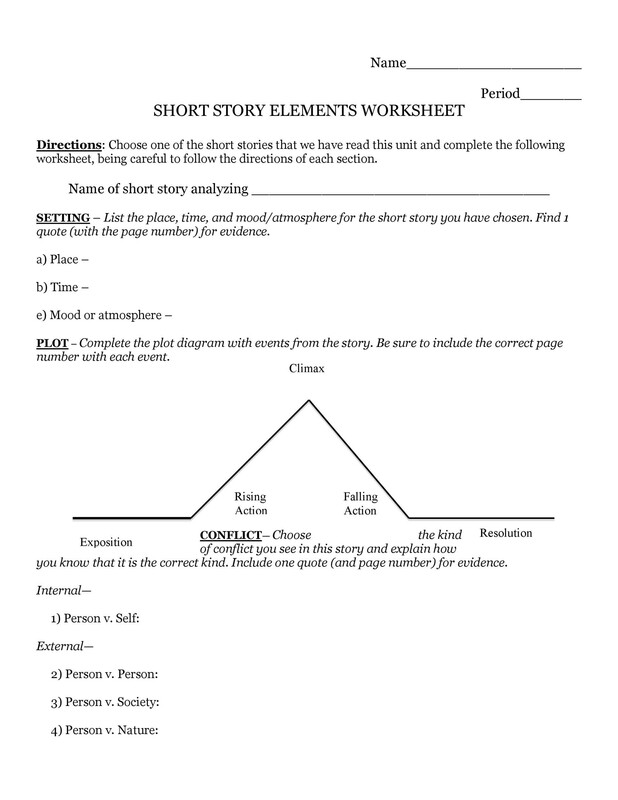 Then you’ll see the relevant parts of the story which you will include in your template. 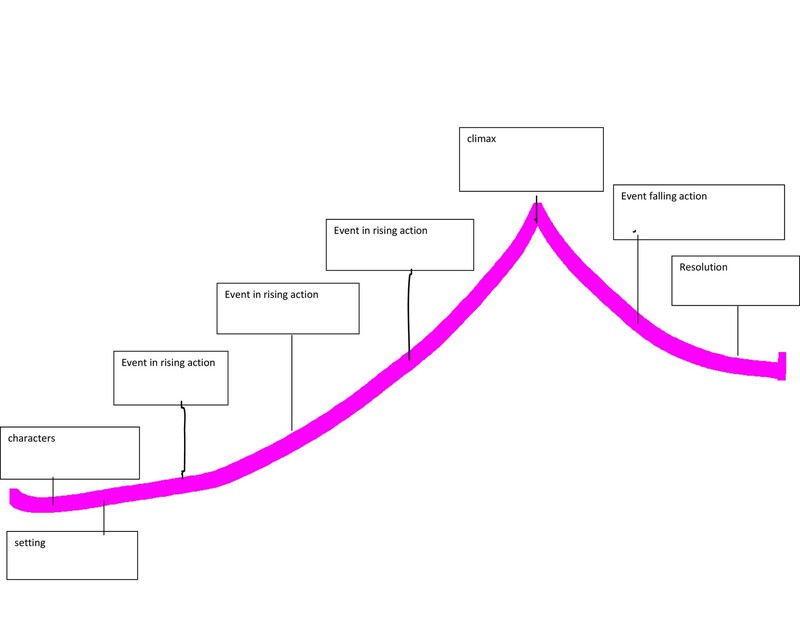 A plot diagram is an important and useful tool. 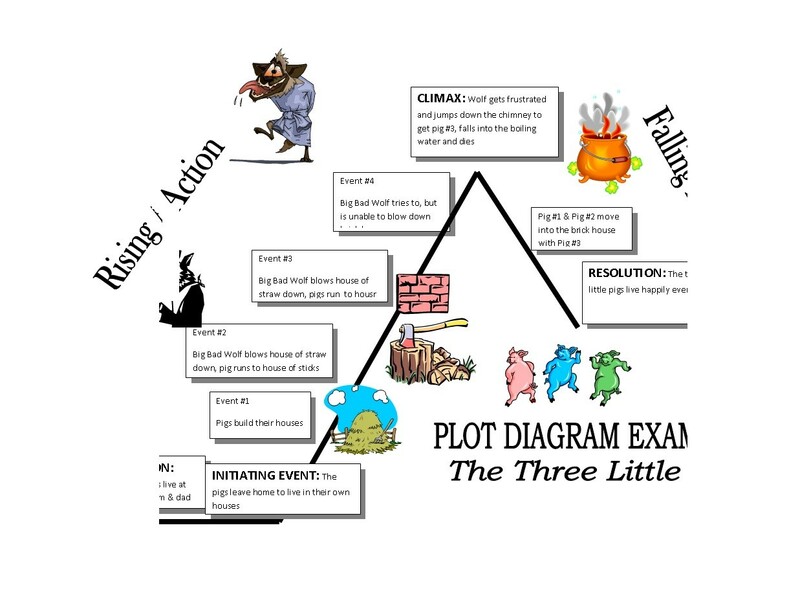 You can use a plot structure diagram to help explain or even create a story. When you think about it, each and every story has a pattern. 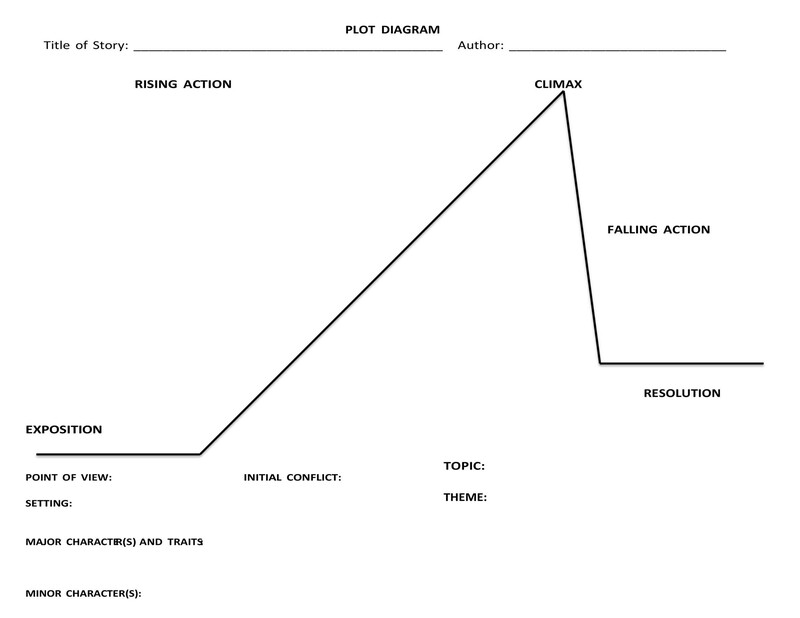 Without this pattern or plot, it would be very challenging for a writer to create a good flow or storyline. 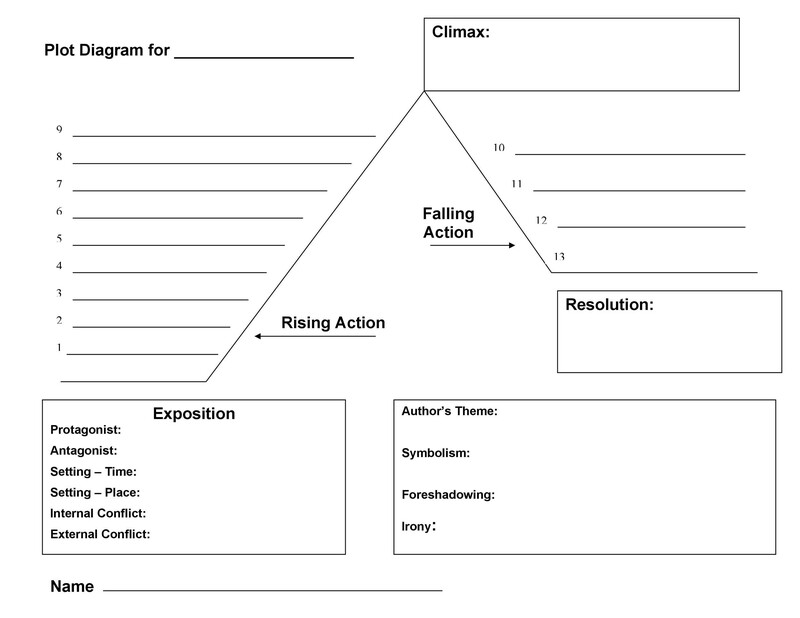 You can use such templates to analyze a story or even use them to plan the story you’re planning to write. 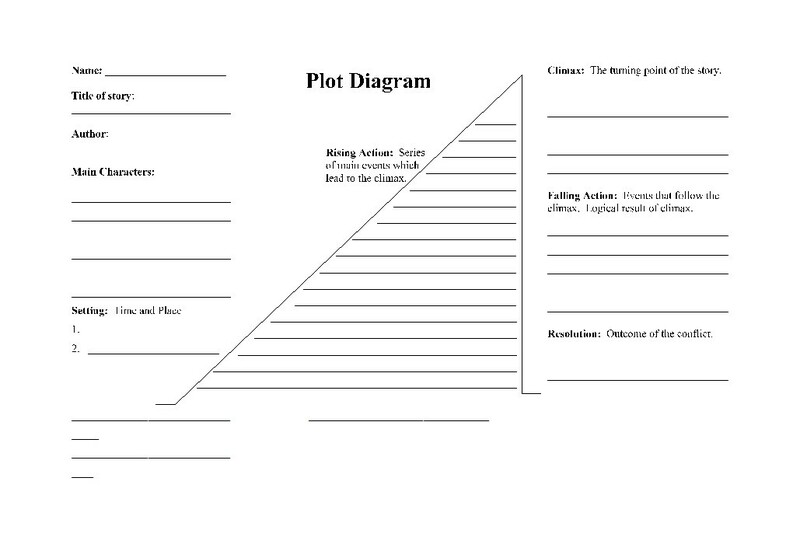 A great plot is usually broken down into different parts. Your goal is to make each part as interesting as you can. Do this so you can capture and keep the interest of your readers. 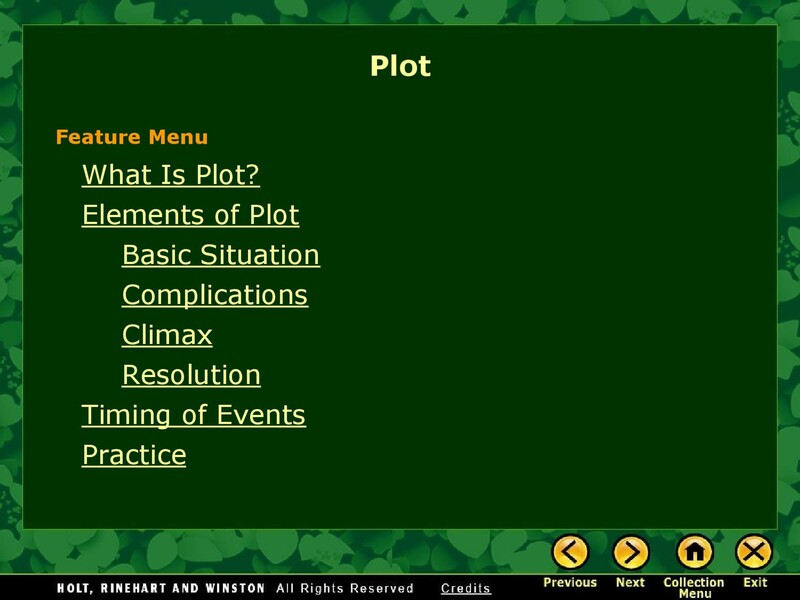 Without a great plot, you won’t be able to attract your readers. There’s one important thing to remember about templates. The one you use should make the details of your story more readable. It should make the plot of the story simpler and more understandable. 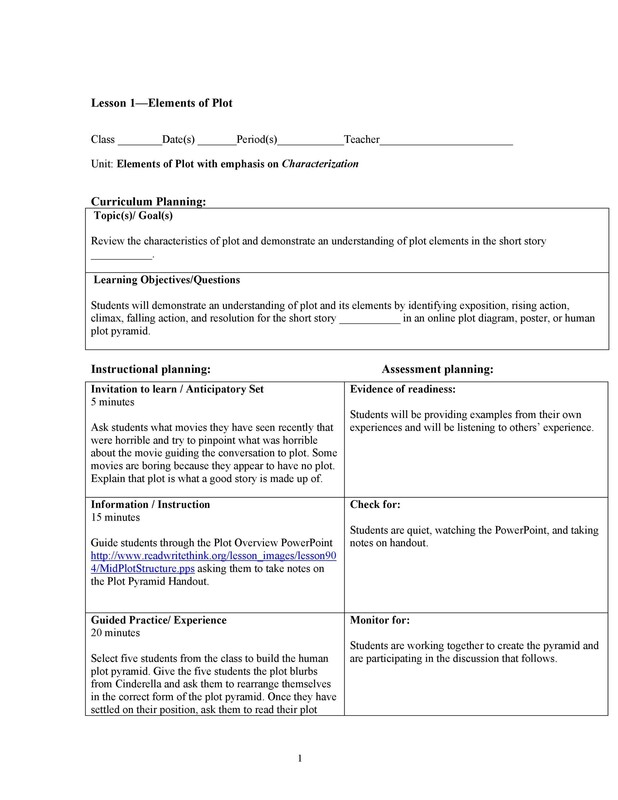 Although you may use varying types of templates, you’ll notice that they all have basic parts. 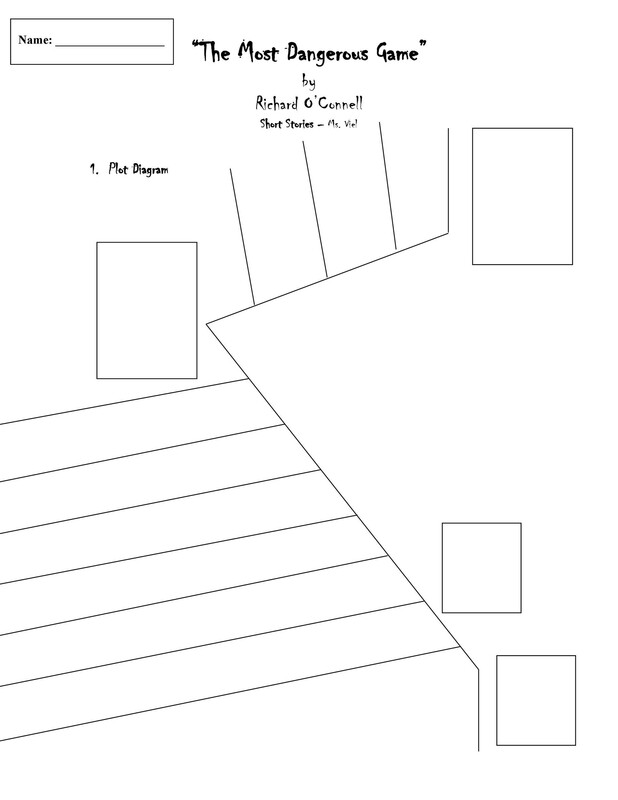 You can also see this in our plot diagram PDF which you can download here. It’s important to know these different parts. You can find the exposition at the start of a story. Here, you introduce the characters of the story as well as the setting. The exposition also presents other information needed. This information is essential for the reader to understand the story. This is also known as the introduction of the story. You introduce the time, place and the mood of the story. Also, you introduce your protagonist and your antagonist. Your characters can either be static or dynamic. The former means that your characters stay the same throughout the story. The latter means that at some point, your characters will change in some way. 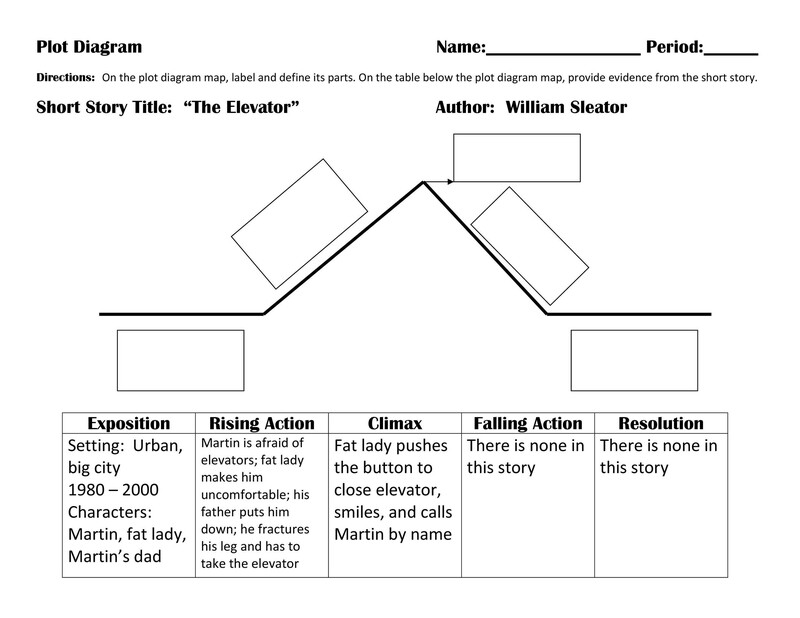 There are also different ways to present the exposition as well as the rest of the story. You can use the first person point of view. In this way, you’ll tell the story through the eyes of your main character. You can also use the third person point of view. In this way, a narrator would be the one who tells the story. You can use a limited third person point of view. Here, the narrator can only talk about the perspective of one of the characters. Usually, the narrator would take the perspective of the protagonist. Either that or you can use an omniscient third person point of view. Here, the narrator is “all-knowing.” The narrator can talk about the perspective of different characters. This part of the story comes right before the climax. It would contain all the events which would lead to the climax. In the rising action, you include the development of your characters. Also, you include some events which will create suspense. 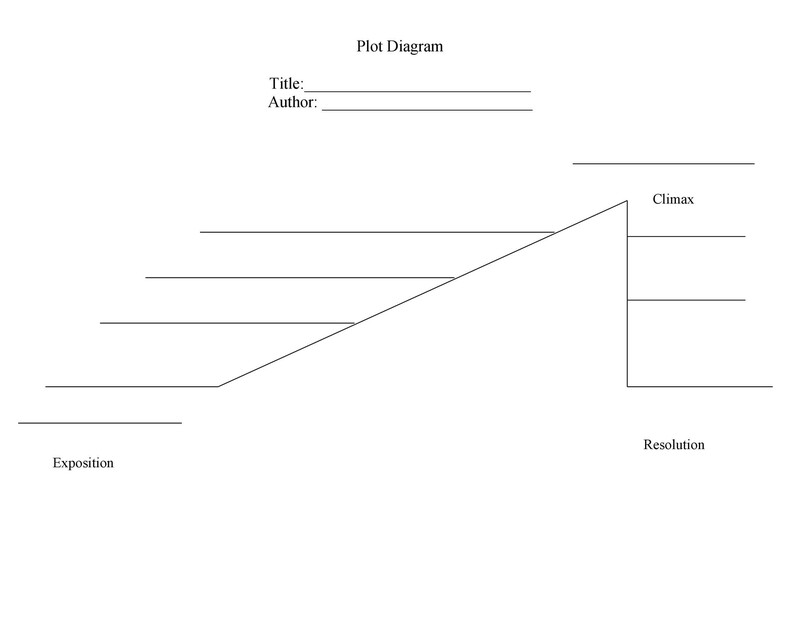 In some cases, this part of the diagram would also present a conflict to the readers. This would be a struggle between 2 or more characters in the story. 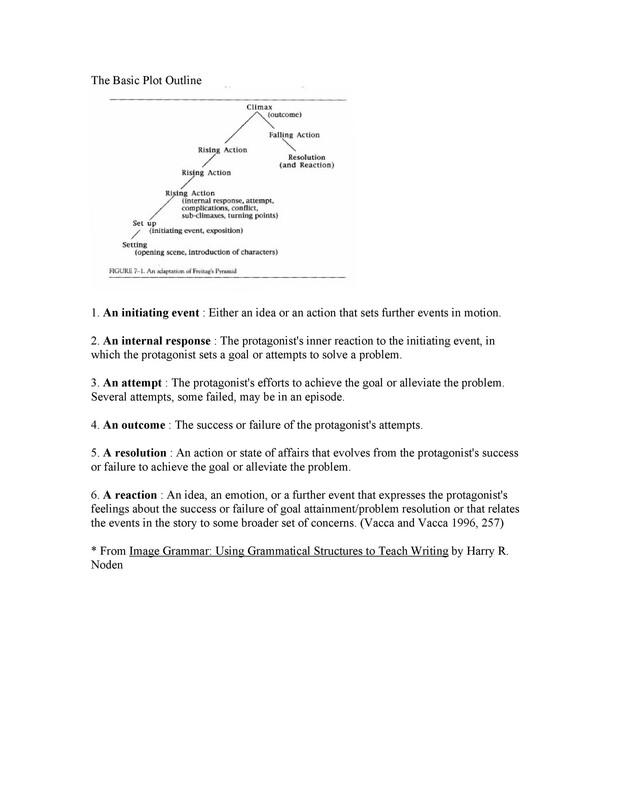 Usually, the protagonist and the antagonist are the ones involved in the conflict. 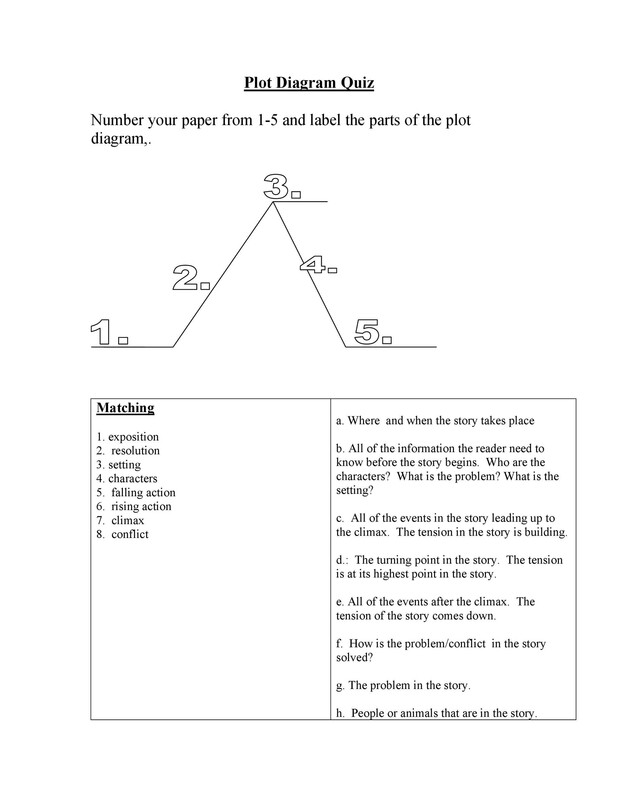 The conflict refers to the main problem which drives the story plot. There are different types of conflicts you can create. First, you can create a conflict between 2 characters. Second, you can create a conflict between the characters and nature. Third, you can create a conflict where the characters fight against the society. And fourth, you can create a conflict where the character battles with him. This is probably the most important part of the story. It’s the “high point” in the story which readers usually focus on. Here, the character would come face to face with the conflict. He deals with the problem and so this becomes the most exciting part of the story. This part comes right after the climax. Here, you tie up all the loose ends in the story. Any conflicts in the climax get solved. 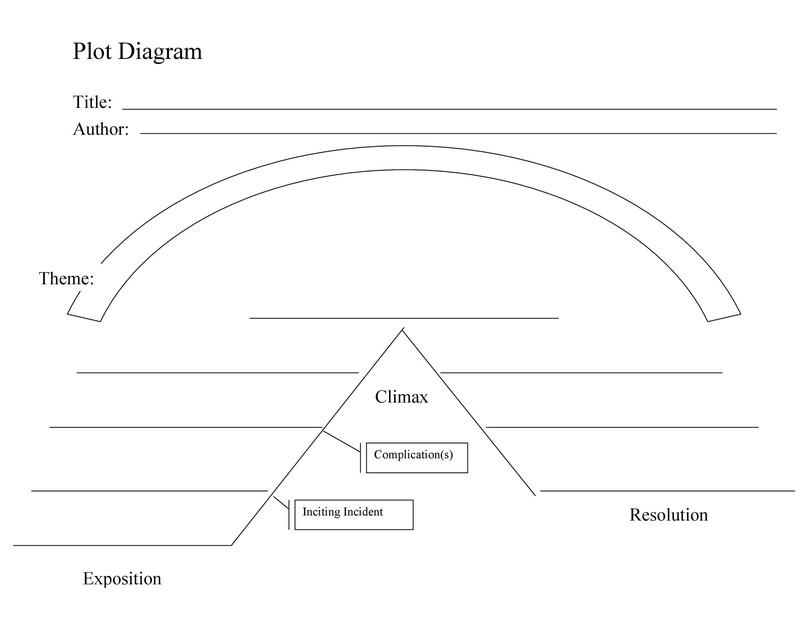 In fact, the falling action happens as a result of the conflicts in the climax. This is the last part of the diagram. Here, the story comes to an end. You don’t have to make a happy ending; the resolution will still complete the story. It can leave the reader very satisfied. However, it can also leave the reader with more questions. Make this kind of resolution if you’re planning to write a sequel. 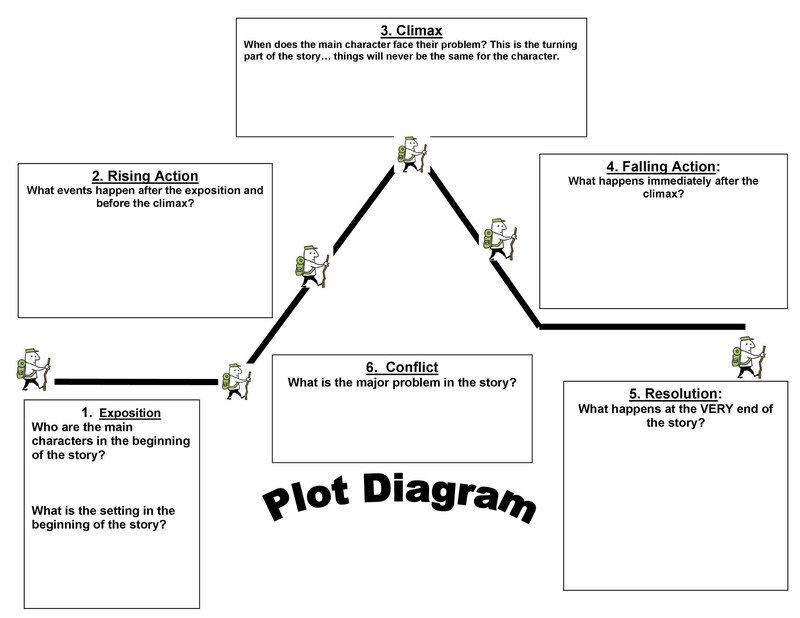 Making a plot structure diagram will help you create a story with a better structure. 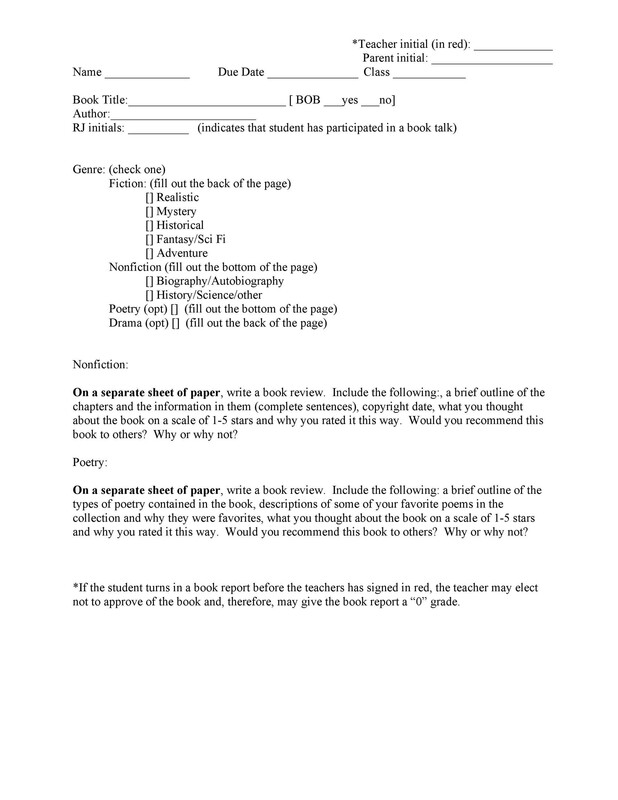 Using one can also help students understand the story better. It’s an engaging way to teach stories interactively. It can help you write faster. 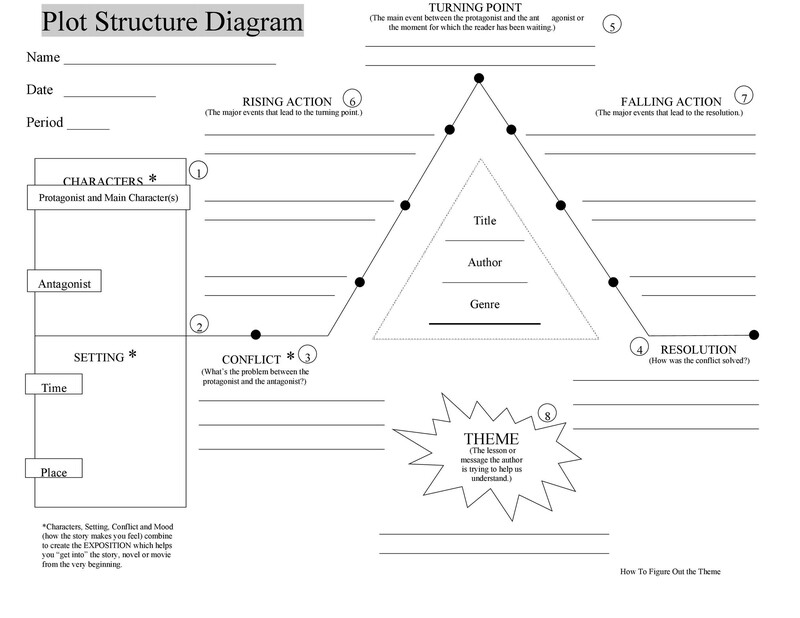 When you plan your story using a diagram, you can focus more on each of the parts. Then you won’t have to waste any time wondering where your story would go. It can give you better direction. 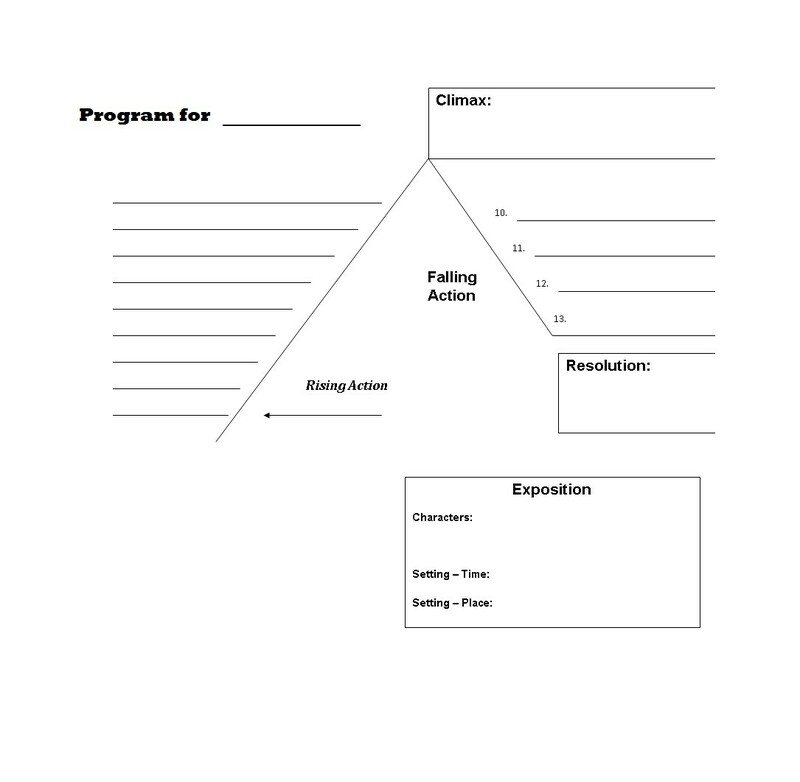 Creating a diagram will help you work towards the goals of your character. 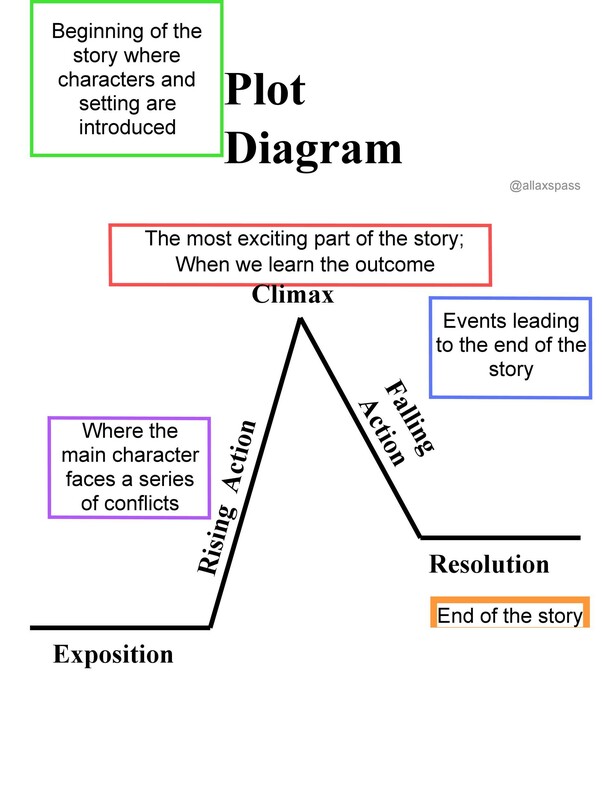 You can also develop your story according to the ending you’ve already planned out. It will save you a lot of time. As you create the first draft of your story, it will be closer to what you had in mind. That is as opposed to if you wrote your story without prior planning. There’s a less chance that you will get stuck at some point. 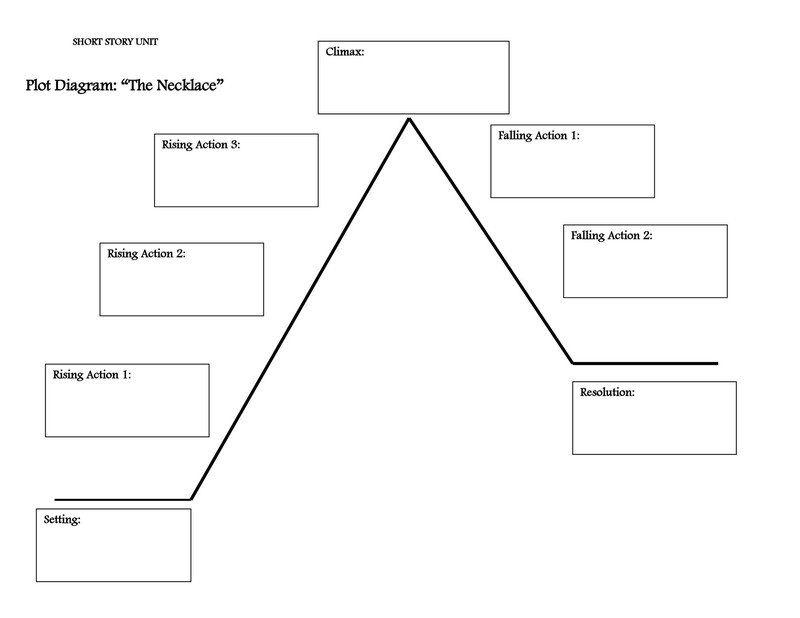 If you’ve already planned your story using a plot map, you’ll know where you’re going. Then there’s very little chance that you’ll get stuck in a plot twist which you aren’t able to get out of. It can help you research better. You may anticipate parts of your story which would require research. If so, knowing them can help you plan beforehand so you can do research ahead of time. They’re flexible so you can still be as spontaneous as you want. Just because you’ve made a diagram, that doesn’t mean that you can’t change your mind. 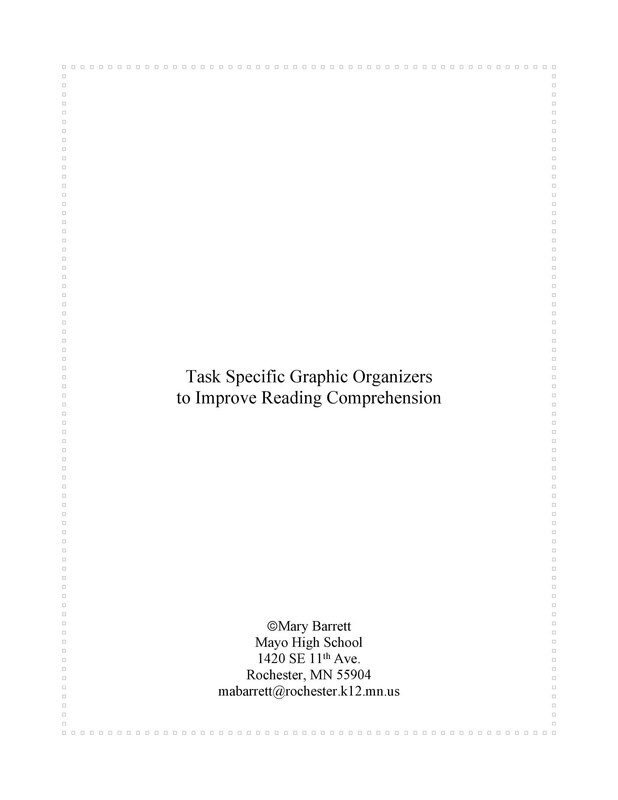 If you want to make changes, simply modify the details on your diagram. It can help you choose appropriate names for your characters. This may not seem like a huge advantage at first. But when you plan your characters well, you’ll be able to think of the best names. This can inspire you while you’re writing your story. It helps reduce the chance of experiencing writer’s block. 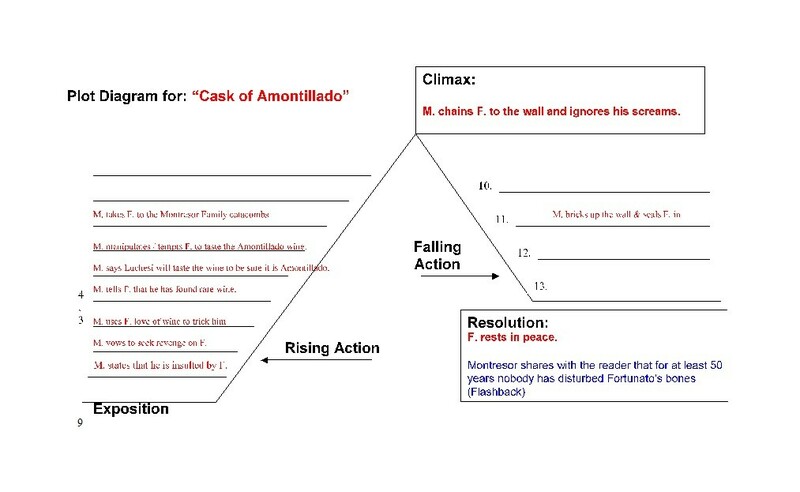 When you make an outline or a diagram, you know exactly where your story is heading. So if you feel like you’re stuck, simply go back to your diagram. Do this to get back on track. It will also help you commit fewer mistakes. 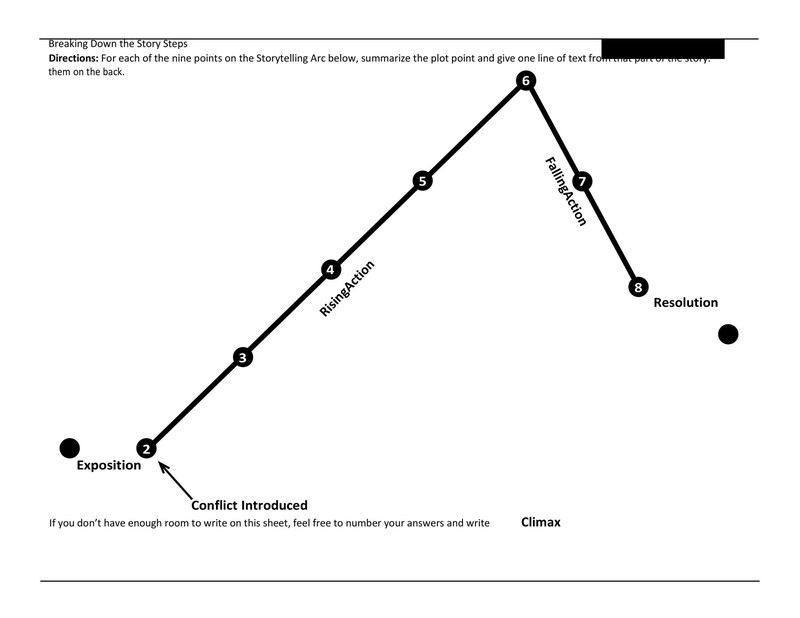 If you’re working with an outline, you can get your story’s structure right the first time. 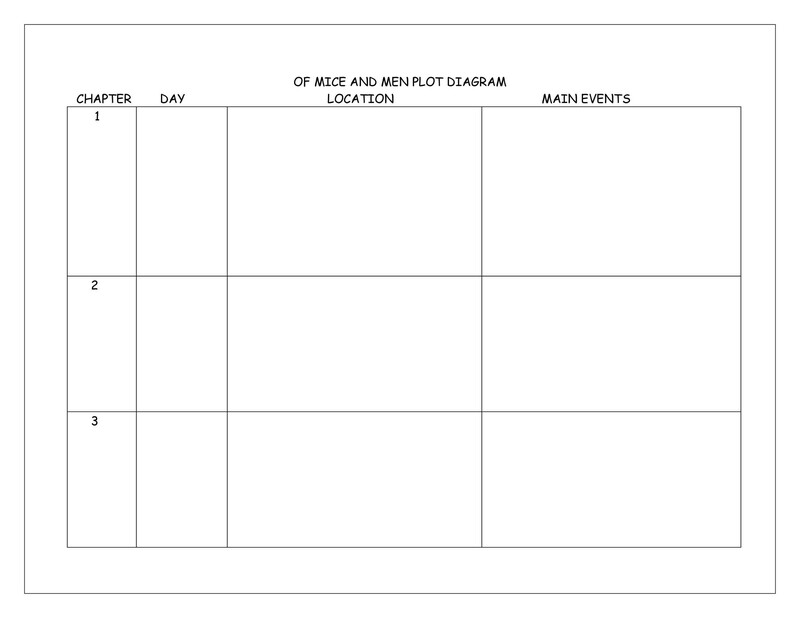 Without the diagram, you might have to go back and forth to arrange the events. If you do want to change any part of the structure, you’ll do so by choice. 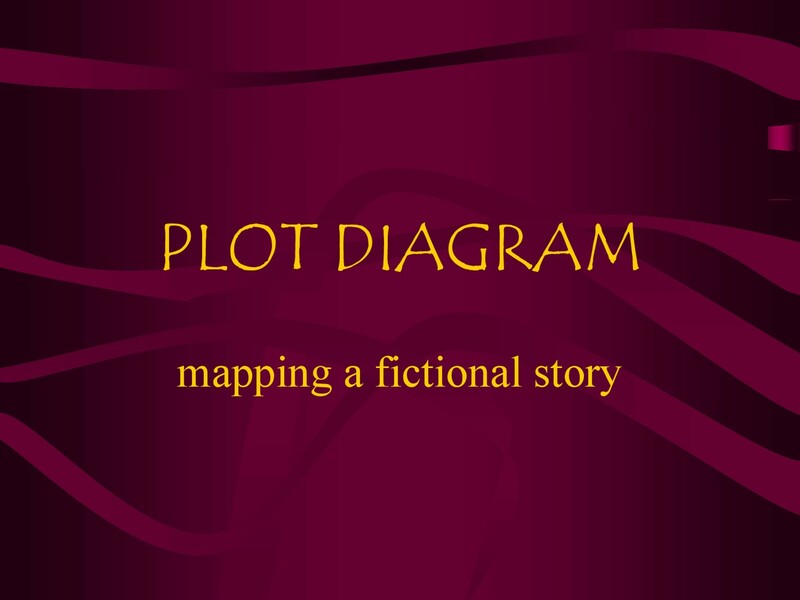 Using a plot diagram PDF can also help you pace your story naturally. This will make you stay on target better while writing. With it, you can stick to your storyline more effectively. 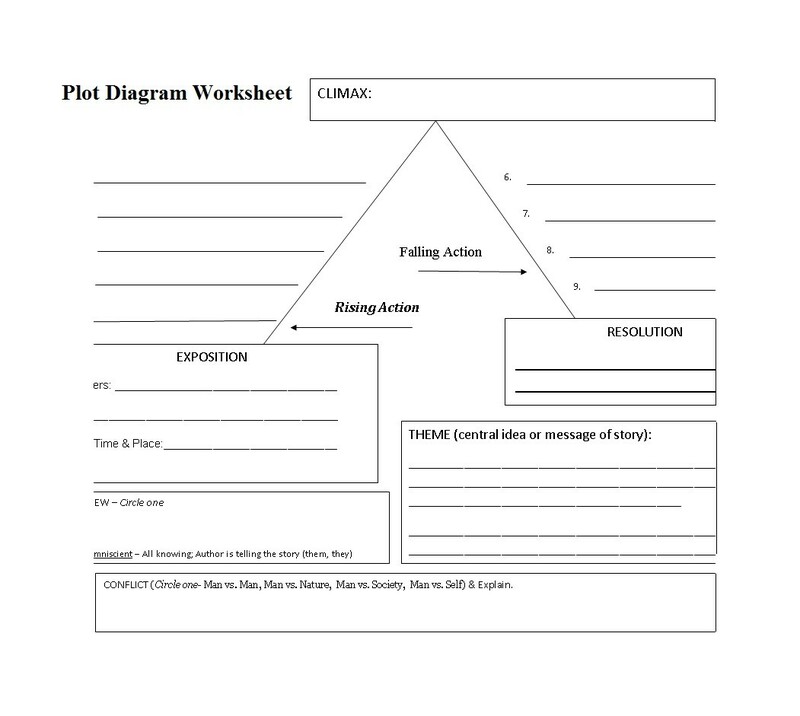 Aside from all these advantages, making a plot pyramid or diagram is also quite easy. 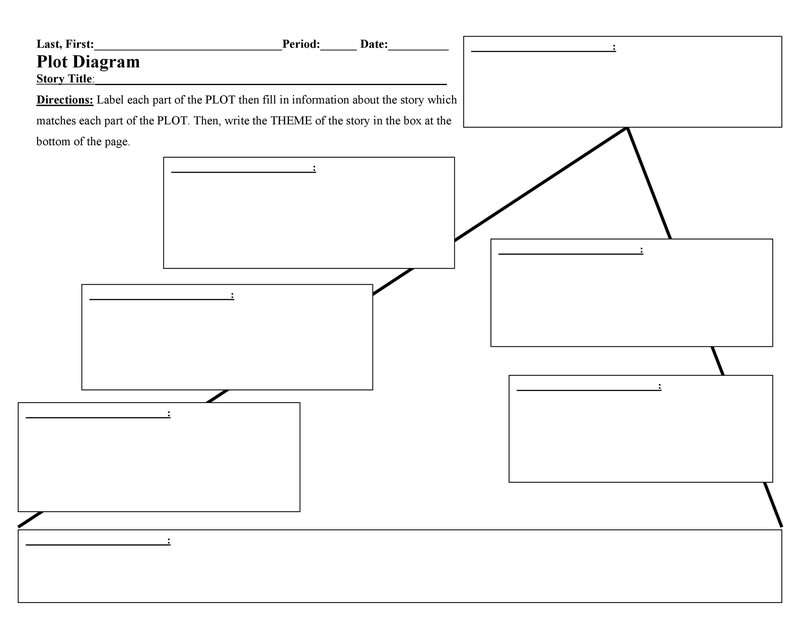 As you’re building your diagram, you’ll become more interested in your story. This will lead to your being more motivated and inspired to write. 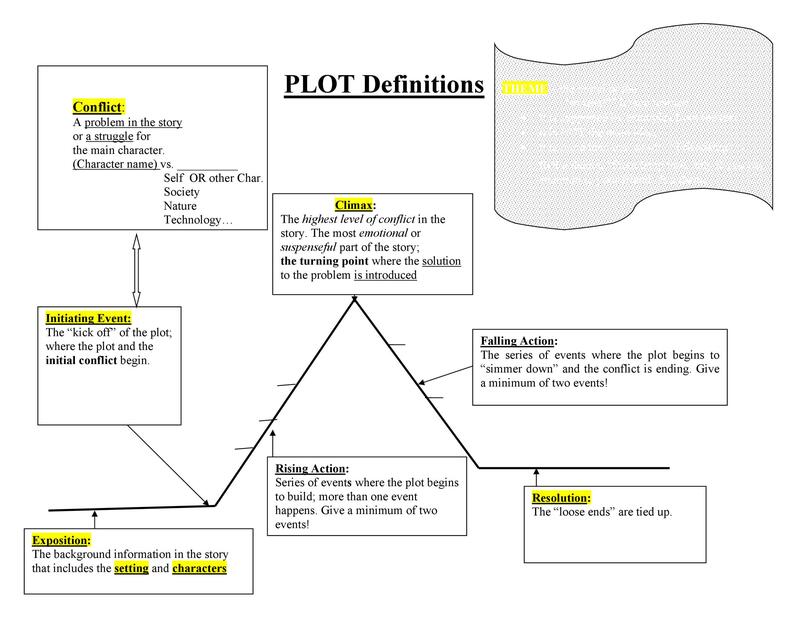 By now you already know a lot about plot diagrams. 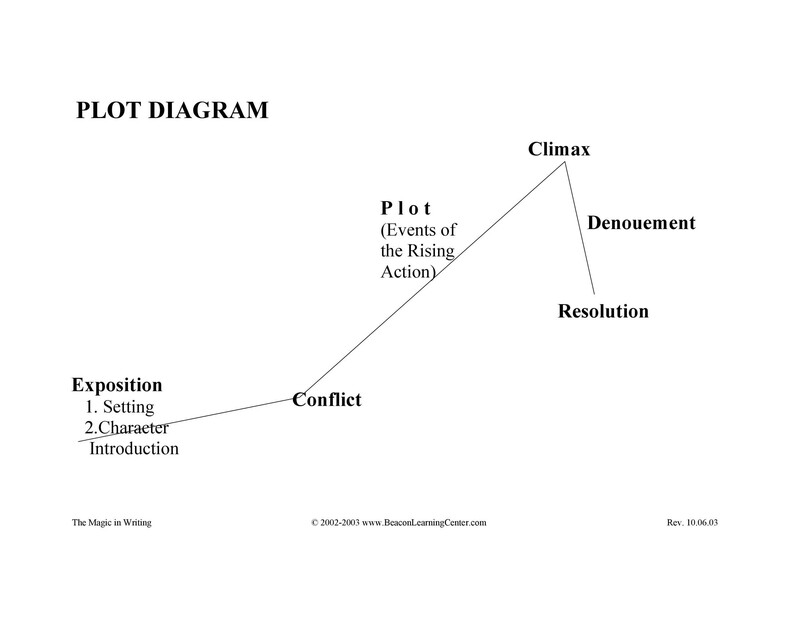 You may want to start creating a blank plot diagram to use when writing your stories. The next thing to do is to learn how to create such a diagram. 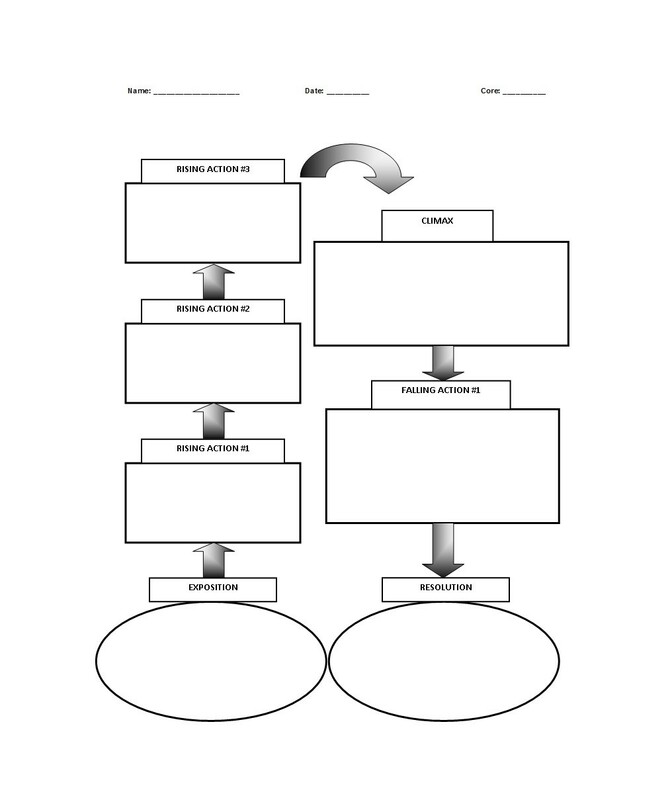 The first thing you need to do is to identify the parts of your diagram. 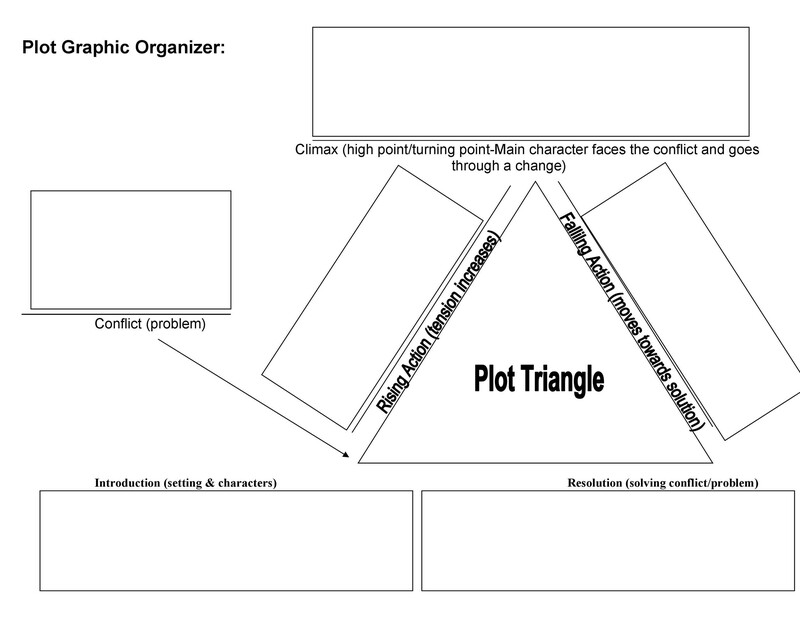 You can use a map, pyramid or diagram when planning the plot of your story. 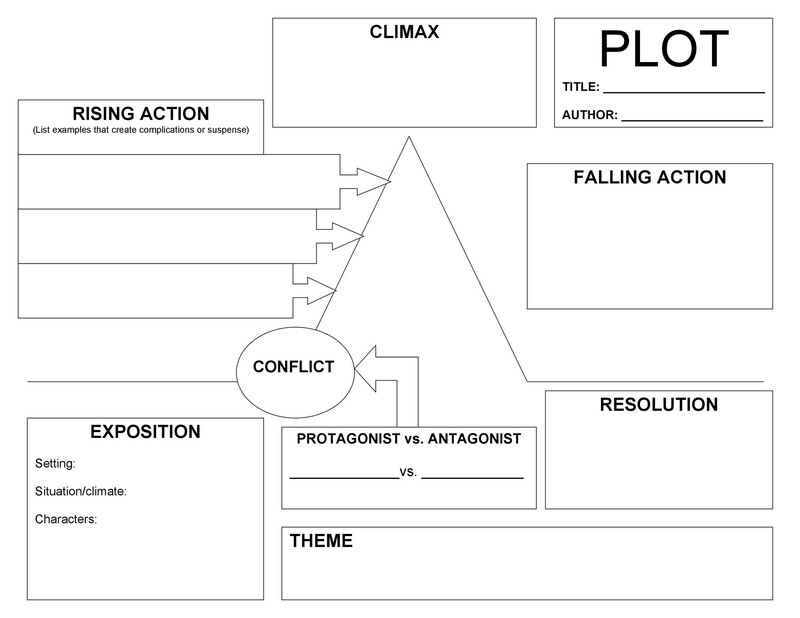 Draw your diagram then write down the parts you’re planning to include in your story. Set the tone for your story. 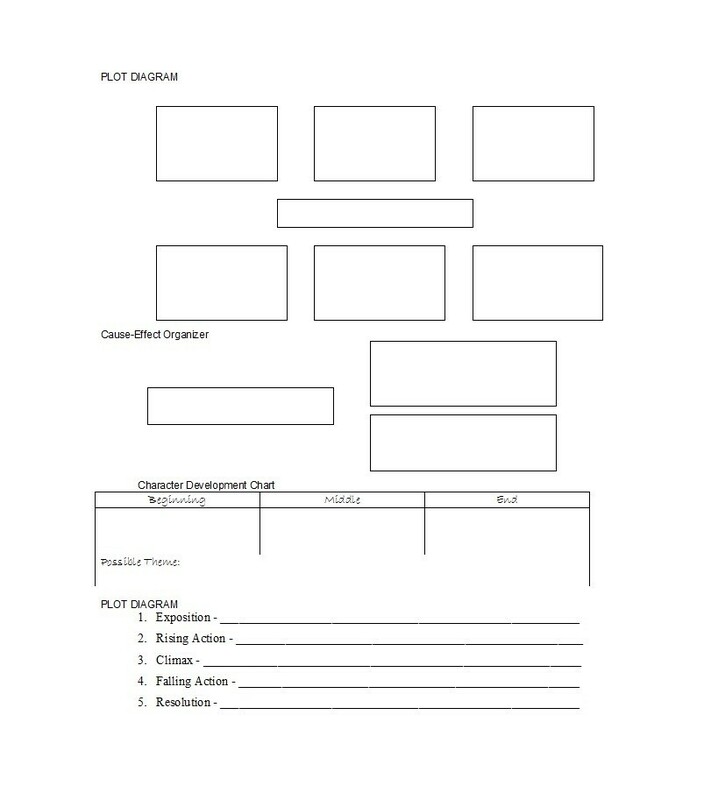 You need to create a compelling set up for your story. You may start with an enticing event or something similar. Think of something which will immediately captivate the readers from the get-go. After the first incident, you can also start thinking about your characters. In fact, you can make the first incident something which changes the life of your main character. Write this event right after you introduce the setting of your story. Then you can start creating your rising action. From the introduction, you need to write different events. Those events should all lead to the climax of your story. 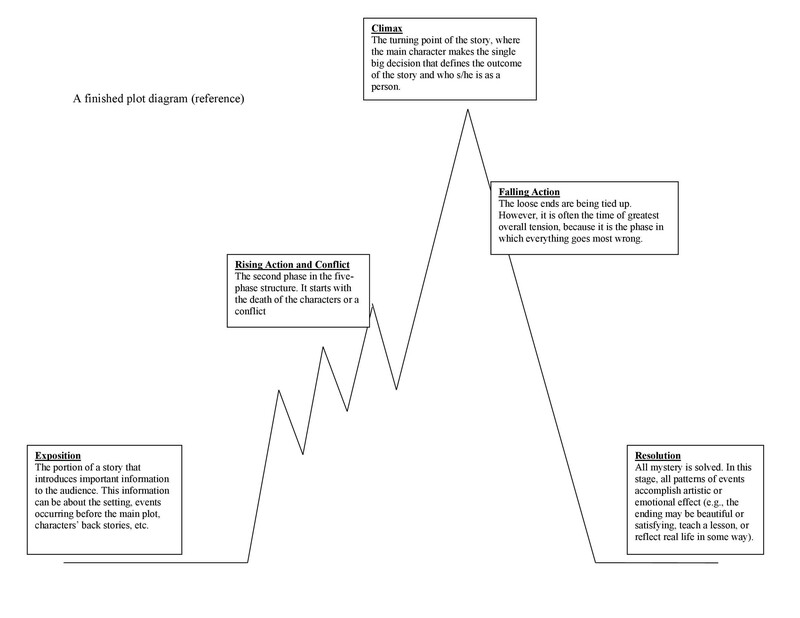 You can show how your characters develop. Also, start introducing the problems which your main character will have to deal with. It’s important to show the development of your characters. You reader has to get to know them as the story progresses. 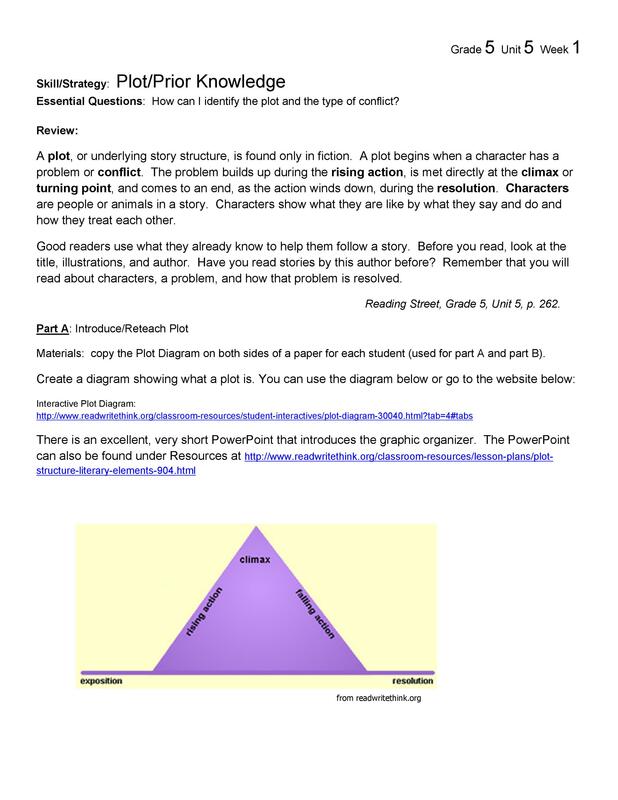 This will help the readers relate to your story more. Also, this will give you a better idea of how to execute plot twists as well as the central conflict. Next up, think about the climax of your story. This should be the most compelling part of your story. It’s the high point and so you should spend time thinking about it. 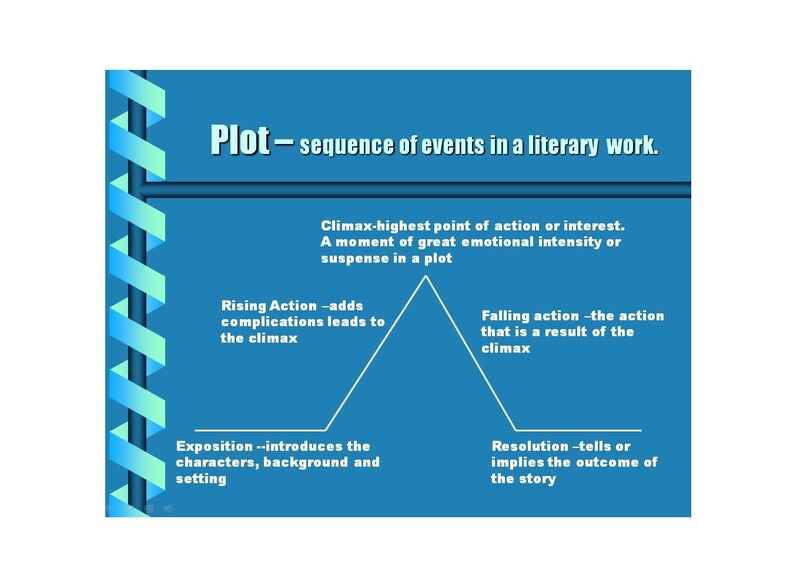 The climax could be a huge setback or challenge in the life of your protagonist. 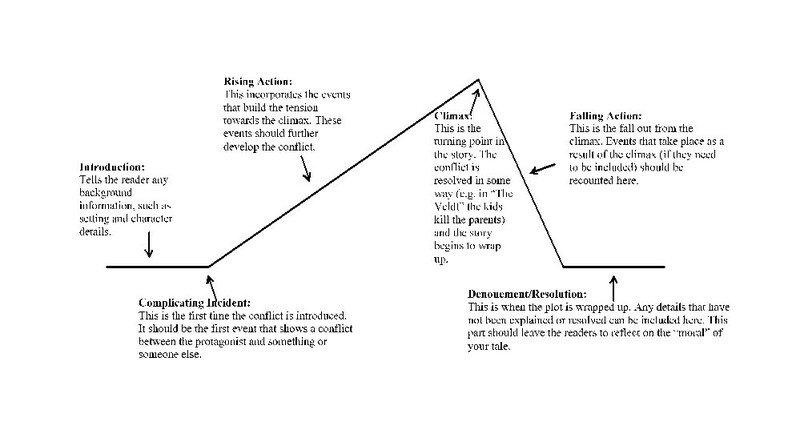 You need to think about how you will let your protagonist deal with the conflict. The falling action comes next. Here, you’ll include a lot of action-packed details. It’s like your story starts to speed down tracks of a roller coaster in order to reach the ending. Create a sense of tension and suspense for your reader to keep him turning the pages. The falling action doesn’t just have to be a single chapter. You can make it last for several chapters. This is especially true if your main character has to deal with a huge conflict. Finally, create your story’s resolution. This is also known as the conclusion of the story. Think about how you want your story to end. You may want your protagonist to overcome the main conflict. Otherwise, you may also want to leave the ending hanging if you’re planning to write a series of stories.